In this custom edition Monopoly, nearly every element of the game has been redesigned: Properties, Money, Houses, Hotels, Community Chest, Chance, Utilities, Railroads, Tokens. Instead of the old stand-by tokens you’ll have your choice of Vulcan Harp, Phaser, Communicator, Klingon Blood Wine Goblet, Shuttlecraft, or Captain’s Chair. The Captain’s Chair is Kirk’s not Pike’s. Still awesome, but well… who wouldn't want to be Captain Pike? Still, the game includes 22 properties from the complete Star Trek Continuum. Buy, Sell, and Trade properties from homeworlds like Vulcan, Andoria, and Cardassia Prime. Starships stand in for Railroads. You get the idea. Game features locations from the favorite episodes and characters. 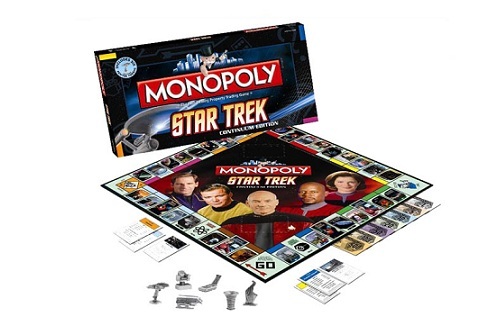 Monopoly, star trek, continum. Buy, sell and trade some of the most memorable star trek locations that make up the continuum. Price: $49.99 & eligible for FREE Shipping.